Thanks to those of you who responded yesterday and today to my invitation to send in links and images of your color-focused work. Below is some of what I've selected to show. I've placed the images in a visual narrative so that the work can speak for itself, but of course you know I'm putting my two cents in, too. 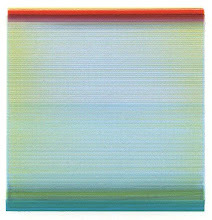 Gary Petersen, Break-Up, 2007, acrylic on panel, 20x16 inches. I'm a fan of these two painters, above and below. 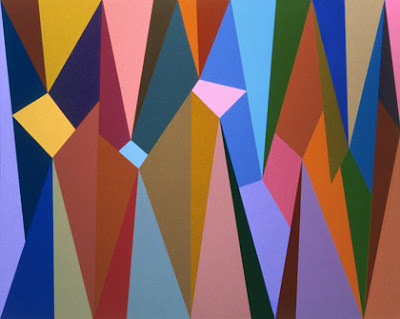 Gary Petersen combines color and geometry in a way I find particularly appealing: It's hard edge but it doesn't slice you up. He works out of a studio at the Elizabeth Foundation in Manhattan. We showed together (along with scores of other artists) at a big, wonderful holiday show called "Punchbowl" at Metaphor Contemporary Art in Brooklyn--and in fact, the picture above is the one in the show, so you can see it in situ. I've yet to meet Eva Lake, below, but we're buddies in the Blogosphere. 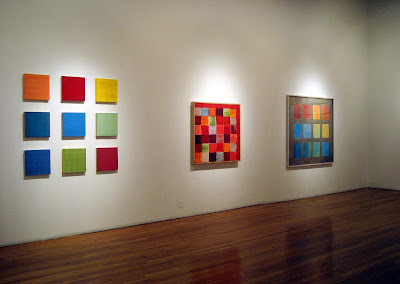 The ambitious work below is from The Richter Scale, shown recently at Augen Gallery in Portland, Oregon. Visually, it's pretty quaky; you can feel the retinal techtonics. 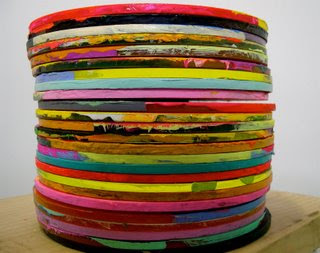 Ken Weathersby, whose work is shown below, is new to me. But perusing his resume, I can see that he shows regularly in New York--and that he's in the 183rd Annual: An Invitational Exhibition of Contemporary American Art at the National Academy Museum on Fifth Avenue, just across from the Met. (Congratulations on that, Ken. I'll be visiting the show soon and will make a point of seeking out your work.) 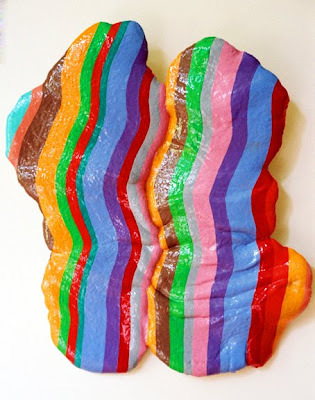 Ken is interested in the inner-and-outer, the back-and-front, the skin and structure of paintings, which puts them in the approaching-sculpture category. Those two rectangles are set flush within the surface of the canvas. 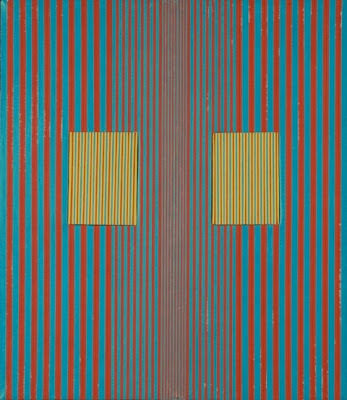 I'm digging the visual connections between and among these works--the crisp geometry, the rectangles, the palette, and the stripes that greate a resonant visual eye-hum. You folks have done a pretty good job of curating your own show here. 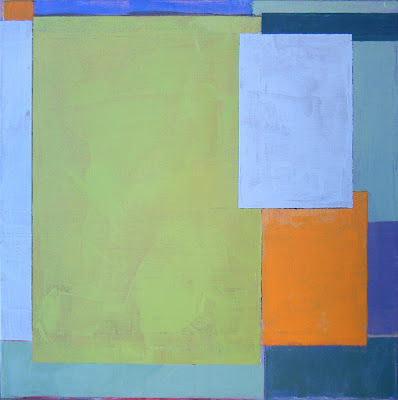 I love the transition between Thomas's quilt-like pattern and Tracy Helgeson's glowing structure, below, not only for the quilt-barn association, but because the angles, hues and shading have such strong affinities. 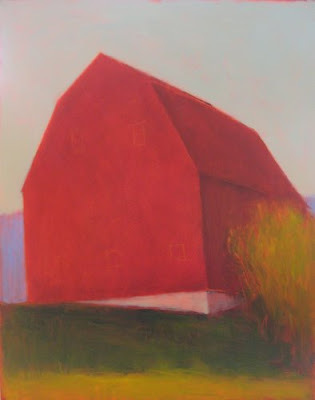 I pulled this image from The Carrie Haddad Gallery website, but you can see more on Tracy's blog, which combines her art life with her family life, smack in rural upstate New York. 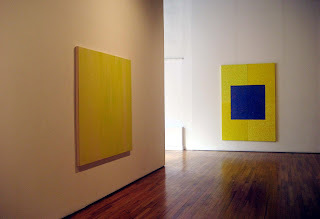 There are two more affinities, below, with painters who are working square with shapes that tend as much toward the biomorphic as the geometric. The Flash construction of Robert Atwell's site, www.robertatwell.com, didn't allow me to pull images, but it it did let me pull the studio image from the homepage. Actually, it's for the better, as you get to see the relationships of many paintings to one another--and to the studio itself, which has its quirky touches of color (note the poles and pipes). I'm not sure where Atwell is from, but Elise Rugolo seems to be from Pittsburg by way of Wisconsin (things one infers from a resume). Her abstraction is a soupcon Fauvist, n'est ce pas?. 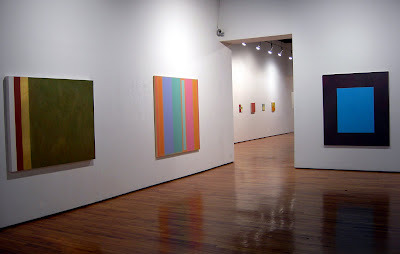 Because I've been busy in the studio I'm a bit behind the curve on shows, but I wanted to acknowledge the Boston Color exhibition at Kathryn Markel Fine Arts while it's still up, through June 28. 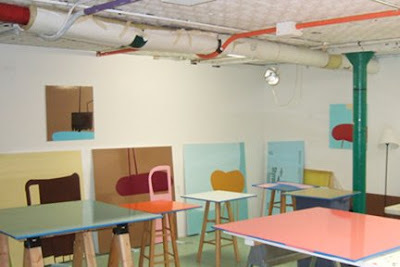 Markel, a generous woman with a small gallery and a big presence (she represents dozens of artists and does many art fairs), visited artists' studios in Boston in the depths of winter and found unexpected wellsprings of color. 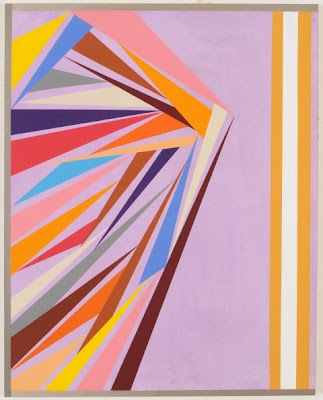 Her field trip has produced a small, nicely diverse collection of strongly hued, easel-size work that could easily have been called "Boston Pattern," so persistent is the repeated geometry of work in the show. The seven exhibiting artists are Diane Ayott, Nancy Berlin, Laura Fayer, Isabel Riley, Kelly Spalding, Craig Stockwell and Suzanne Ulrich. 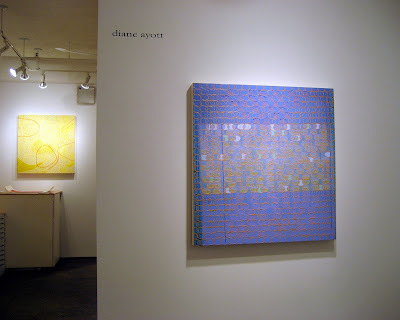 Diane Ayott is a friend. 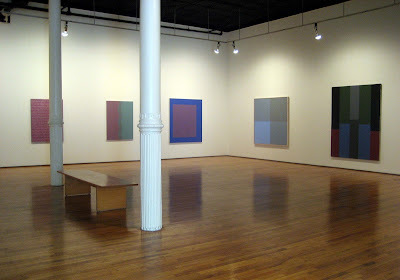 I know and like her work and have visited her studio north of Boston. She paints energetic patterns that from a distance look like solid, vibrating hues, but from up close reveal themselves to be a riot of fine-lined, overlapping and jumbled patterns into whose tangle you willingly tumble. Diane uses the phrase "pleasure in the visual" when she talks about her work. I think that's just right. 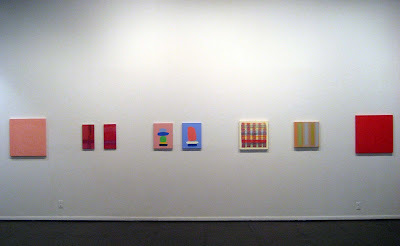 She's also got work in the No Chromophobia show at OK Harris. Remember the child's play of using a compass to make circles and then fill them in with color? Craig Stockwell does the artist version of that, creating masses of layered and overlapping spheres. He traces the edges into lyrical sweeps that have you dipping into and out of a flat picture plane. 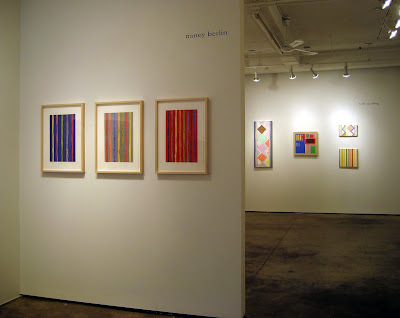 I first saw Stockwell's work at the Genovese Sullivan Gallery in Boston--two solo shows, I think-- and though his imagery has evolved, those circles and their undulating patterns remain a signature of his work. 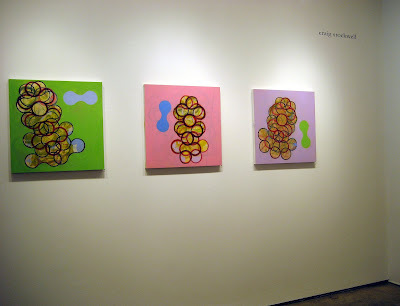 Suzanne Ulrich also works with circles. 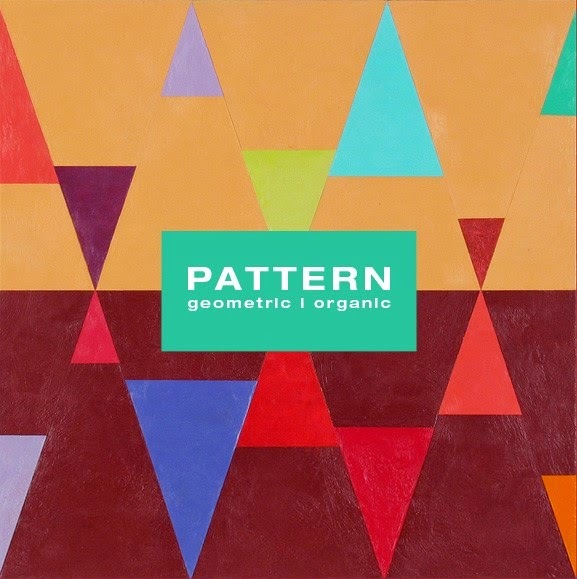 She makes collages--fabulous little minimalist compostions of geometric pattern. I first saw her work at the Copley Society in Boston about six years ago; there the work was quite small, the imagery was rectilinear, and it was comprised of tickets and other printed material, some of which she had painted over with gouache. 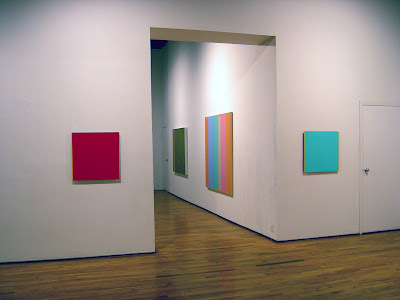 Here there are effervescent open circles whose energy is barely contained by the frame of each work. The other artists in the show I'm less familiar with, but I have seen Laura Fayer's work previously at Markel. Hers are paintings that seem to involve elements of painting and printmaking--fairly reductive imagery for the amount of technical stuff she layers on. 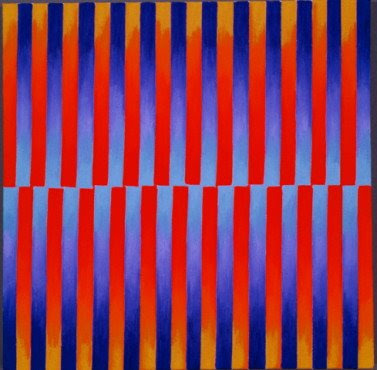 Nancy Berlin shows three retinally acrobatic vertical stripes. 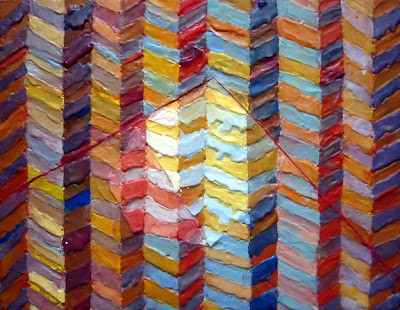 Kelly Spalding is represented by an installation of stripes and geometries in gouache on linen canvas or dish towels--an odd but interesting combination of materials--while Isabel Riley creates wildly colored architectural compositions from fabric scraps and crocheted bits of cloth (I like everything about them except the little loopy crocheted edging). This post is the last in my "Awash in Color" series but, fear not, color will never be far from this blog. Click here for "No Chromophobia." So a friend e-mailed me the other day to ask, "Who is this Mr. Biv?" If anyone is similarly confounded, think back to third grade. It's the mnemonic used to help you remember the spectrum. Remember? Since we're discussing Roy (and in the interest of equal representaton, it could just as easily have been Rona, you know), I'd like to show the work of a few more of his friends. Most of these folks I know, a few others I don't. I'm motivated strictly by the chromatic intelligence of their work. 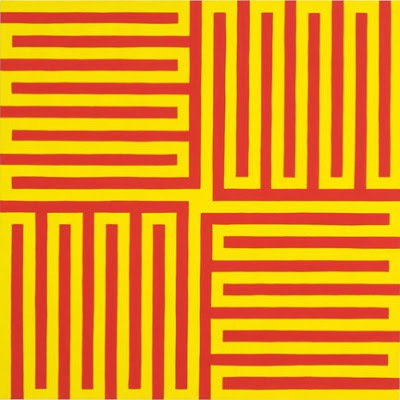 For some of these artists, color is not necessarily the dominant element, it's the geometry. But we don't have to take sides, as color and composition are perfect complements. 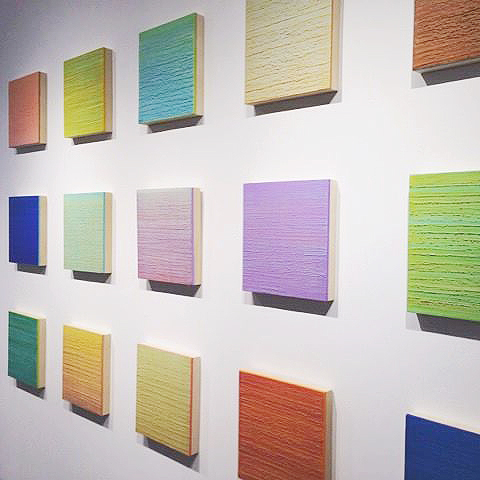 I curated Julie's work into Luxe, Calme et Volupte last year at the Marcia Wood Gallery in Atlanta. I'm impressed with the intellectual rigor and physical demands of her work. On such a pristine surface, there's no going back and painting over. Decisions made are decisions maintained. 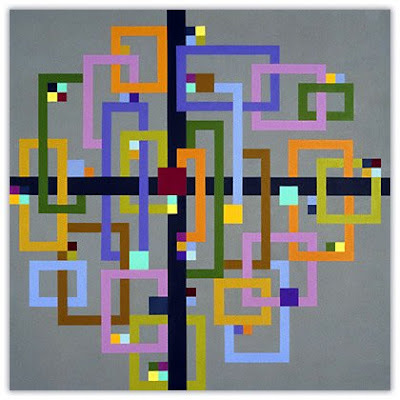 This is a breakthrough painting, because there's now a figure-ground relationship in the work, and the color has a chance to interact with the viewer's eye from various points in a visually dimensional space. Julie is the editor of Geoform. You can see her work there, or on her own website, Karabenick-Art. "Having taken into consideration years ago the consensus decision of the art world that painting was no longer acceptable as an art form, it seemed necessary to move my awareness to a second level. Accepting the idea that one could no longer paint in good faith, I thought it would be possible to paint on another level, one providing a certain distance, in order to look at the paint rather than at its subject. 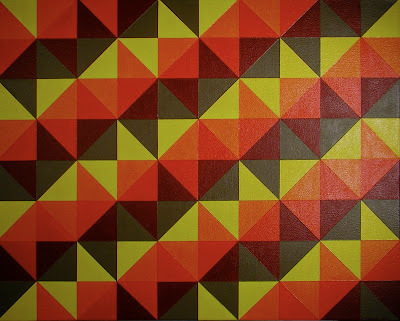 It would be possible to paint "as if" one were painting, using the materials and techniques of painting, but without referring to a separate subject. This thinking led me to monochrome. Thus I do not paint with the intention of making a painting as such, but I work from the outside of painting using traditional methods and materials to discover a new image. " 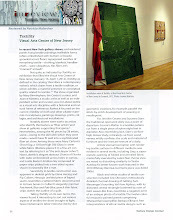 (Why Paint: Marcia Hafif from the catalog Marcia Hafif: Red Paintings, Verlag der Galerie Conrads, Neuss 1990 ). 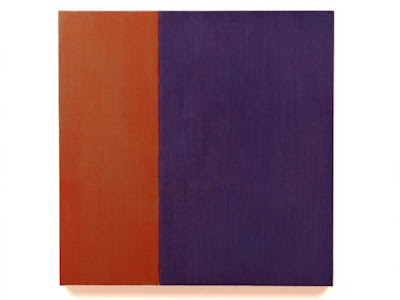 In this relatively newer work, the vertical created by the abutting of two colors creates an image--a "painting as such"--but it does so on Hafif's terms. Chris works in a unique way, creating "drawings" directly on his computer screen using HTML code. They could easily be called "paintings," but I'm using his preferred word. 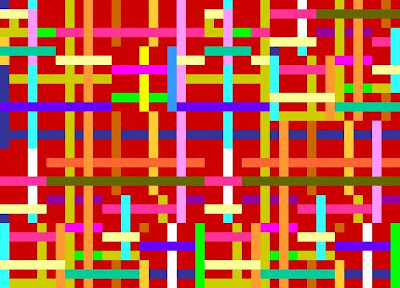 The work is created using, I think, numbers that translate into blocks of color, so it's keystrokes rather than brush strokes that make the work. Lately, the work has made the leap off the screen and into a printed image, which makes me call them "paintings," but I suppose technically that would make them prints. In this new incarnation the saturated color on creamy paper has the look and visual feel of super-saturated gouache on watercolor paper. Visit his website, Look See, to see much more. BTW, Chris wrote about my work in his blog a couple of years ago. Then I curated him into my Luxe, Calme et Volupte show. (You see how my blog world has very few degrees of separation; but then, that's true for the entire art world, where three degrees will probably take you back to the Cave Painters). In the fall we're going to be in a show called "Calculated Color," curated by the painter Jane Lincoln, at the Higgins Gallery on Cape Cod. 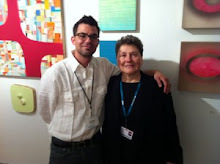 Oh, and we're both part of the Geoform.project, along with Lyda Ray, below. Full disclaimer, yo. 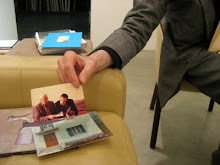 Tallman is a painter and sculptor for whom materiality is essential. Indeed, you can't disentangle the painter from the sculptor any more than you can disentangle the color from the form. Visit his website and his Color Chunks blog to see what I mean. I don't know him, but when I found his blog I felt an instant affinity for what he's doing. I suppose "Friends of Mr. Biv" will become a recurring feature on this blog. Stay tuned. 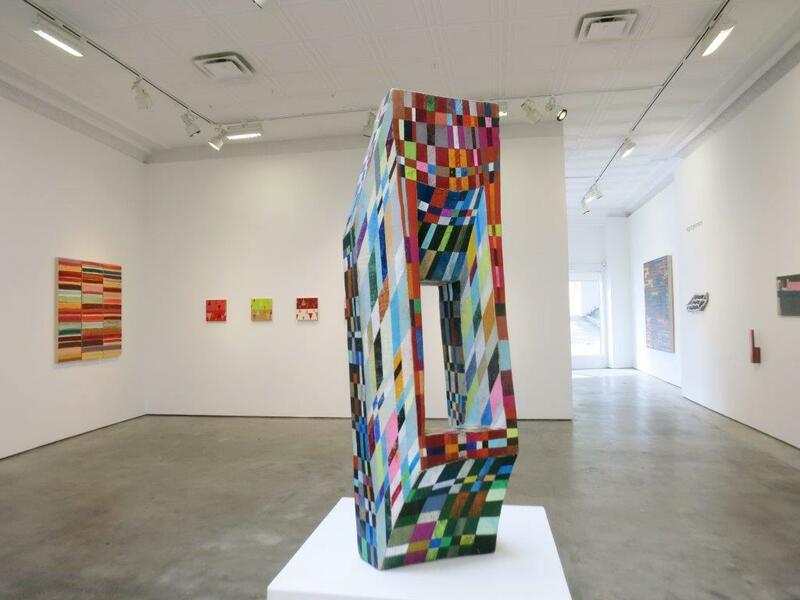 Awash in Color: "No Chromophobia"
This post is about “No Chromophobia,” an exhibition of non-objective color on view at OK Harris Works of Art through September 6 (with a hiatus July 12 –September 1). I’m in the show, so consider this an exhibitor’s report. It’s a painting show. If you left the Biennial hungry for, well, anything besides junk in the hallway, this is the antidote. And by design, it’s a show of work primarily by women artists, so if you left “Color Chart” at MoMA wondering where the other half of the art world was, voila. But let me state flat out that it’s not a “women’s show” any more than Color Chart was a “men’s show.” Still, I like the numbers—and the work—here. 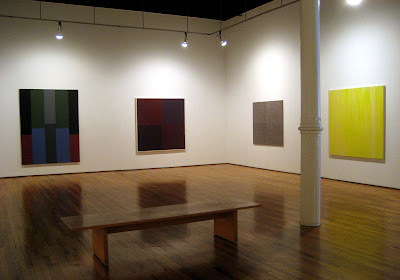 The enormous two front galleries hold the larger work, from Pat Lipsky’s dark-toned geometry to Rebecca Salter’s subtly textured monochrome to higher-key color fields by Marthe Keller and Louise P. Sloane. 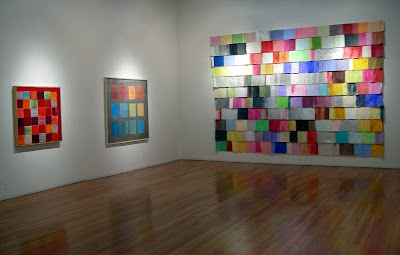 Sloane's more saturated palette, along with the room's strong sense of geometry, carry you into the second gallery where more highly chromatic work by Sharon Brant, Paula Overbay, Diane Ayott, Rose Olson and others dominates. 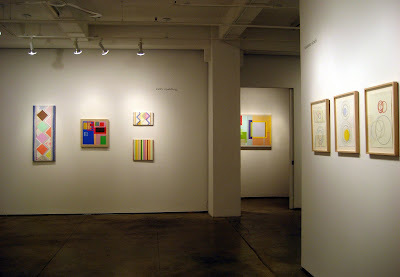 There is a visual narrative in the exhibition that takes you from large and minimal to smaller and more compositionally complex, so that by the middle room (ego alert: where my own work is installed) there’s a mix of the two, moving to more compositional abstraction in the smaller back gallery. By the time you reach the large back room, size—small—is the overriding element, with a range of visual expression in evidence. 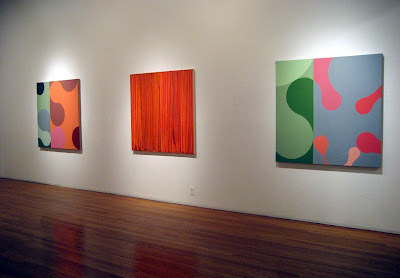 On the wall to the right of Daley's work: fluid geometries by Julie Gross on either side of a poured color field by Kate Beck. 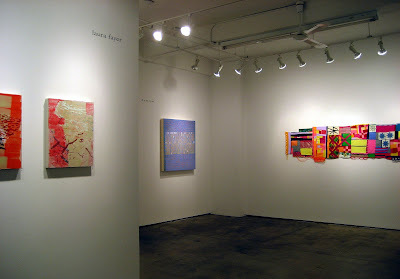 On the long wall in the back room: Paula Overbay, two small vertical works by Rose Olson, two by Soonae Tark, one of my grids, Doug Ohlson, another by Overbay. The size of this show alone would make it impressive, but the selection is beautifully curated and installed. 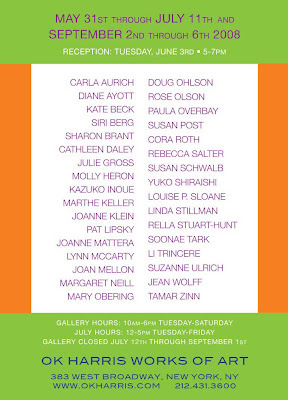 Viewing this show, I have been introduced to the work of artists whose work is new to me, just as I have had the chance to see new work by artists whose work is familiar. 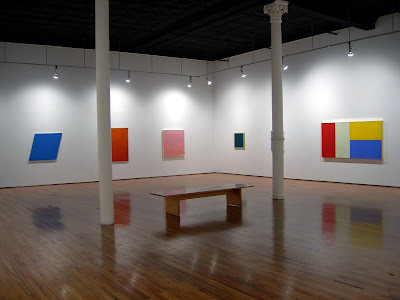 Happily, we are awash in shows about color right now--what little miracle seeded the ether to compel so many gallerists to focus on hue at the same time?--and I am honored to be part of this one. 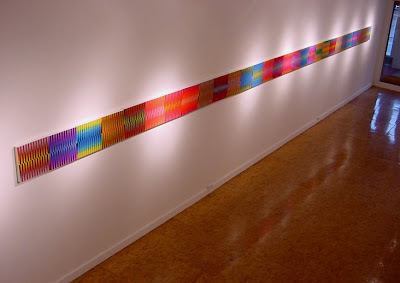 The show was curated and designed by Richard Witter, the gallery’s long-time installer, and managed by Suzanne Kreps, the gallery manager. The two knew it would be an abstraction show, but the parameters shifted this way and that as they made studio visits and tossed around ideas. 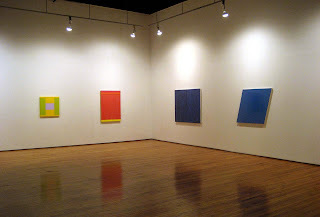 The focus on non-objective color sharpened slowly--and independently of all the other color-themed exhibitions. The idea took a more concrete form a year ago January in the "cold and bleak" dead of winter, recalls Witter: "I needed a shot of Jules Olitski." 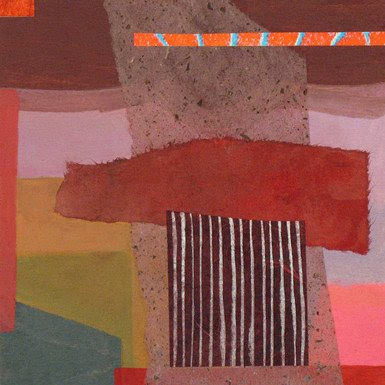 Instead he purchased two little brilliantly hued gouache abstractions at a small gallery in Chelsea, and that started him thinking about color as subject, as object. Another parameter was materials. "I knew I wanted traditional tools and supports--the brush, canvas, panels, paint, artists colors," he says. And another: a reductive sensibility. "I wanted [the show] to be a portrait of color." But get close and look at those surfaces--tactile, sensuous, sublime. The art world may be growing younger by the minute, but paint handling like this develops over time. If the Chelsea sirens have pulled you away from SoHo of late, let the chromatic call of this show bring you back downtown. Has anyone see that new document produced by the NEA? 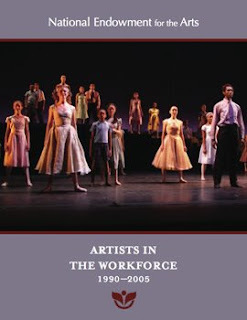 Artists in the Workforce 1990-2005. I was all excited about it, until I got their "executive summary"--a brochure of "key findings." What I wanted was the 135 page PDF document. That's what I thought I was getting (silly me); I guess the gov doesn't want to use the ink and paper any more than I do. Still, it's a pretty expensive brochure, and I’ll bet the PDF printed on cheap photocopy paper would have cost less.
. Artists remain in highly concentrated urban areas. So do galleries, art fairs and collectors. Quel surprise.
. Artists are 3.5 times more likely than other workers to be self-employed. Well, duh. Unless you’re doing a community mural, or you’re Mark Kostabi, who else is going to be making your art? And now for some real shockers. Ready?
. One-third of all artists work fewer than 50 weeks a year. . . . and . . . 28 percent of artists work for less than 35 hours a week. Perhaps that’s because they’re also working a 40-hour, full-time, income-producing job that may or may not be art related; or they’re juggling freelance work or several part-time jobs before they can actually get into their studios to make art? So in fact, I would say that three-thirds of all artists are working closer to 70 or 80 hours a week. Bravo! But, dude, put your money where your mouth is. Isn’t it time that the NEA started funding artists again? 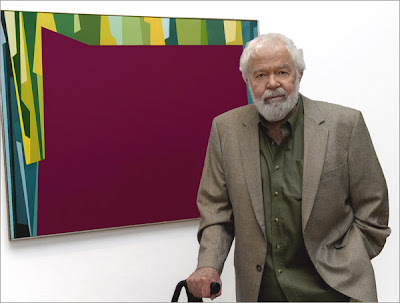 Karl Benjamin, a founding father of geometric abstraction, is the subject of a newly posted, long and in-depth interview with Geoform editor Julie Karabenick. "He is simply the most wonderful, generous man, " writes Karabenick in the course of an e-mail correspondence with me. "He has helped so many younger artists, as well as having an amazing art career. I have a very deep respect for him and am glad to see he's starting to get more recognition on the East Coast--of course, he's an icon on the West. " A recent portrait of the artist in front of I.F. 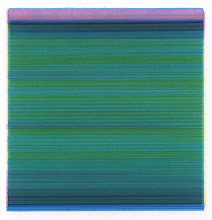 Big Magenta with Green, 1959, oil on canvas, 40 x 50 inches.